Until May, NASA thought they were tearing down Pad 39-B to re-purpose her for the Constellation program. Then, for a second time, just as the new spaceship was about to be manufactured, Obama canceled it. Millions were wasted. In preparation for Constellation, three lightning towers were arrayed around the launch pad at 39-B. Why? Who knows — lightning never struck a shuttle on the pad or even came close. Until these lightning rods were erected, that is. Now huge strikes are hitting the pad, although not striking any vehicles (since there are no vehicles on the pad to strike). Launch Pad 39-B on November 23, 2011. The stairway in the foreground is Apollo era and aging. The stairway leads to the transporter, shown here just behind the stairway. 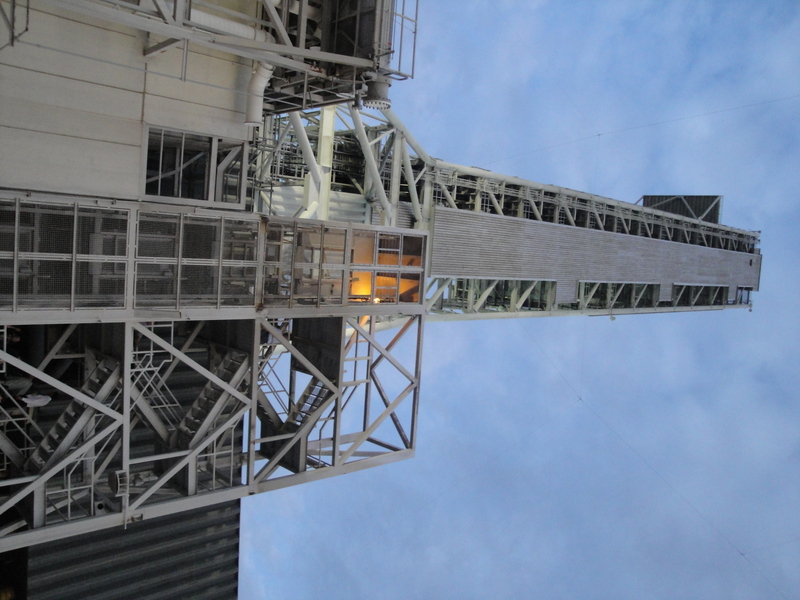 On November 23, 2011 NASA took reporters by the stairs, and by elevator to the very top of the pad, about 350-feet above sea level on open grates. The next time this configuration will be on Pad 39-B will be, at the earliest, 2017. Pad 39-B, like its identical twin, 39-A, once launched men to the Moon and was active during the shuttle program. One historical fact about 39-B is not a happy one. Challenger lifted off from this pad on January 28, 1986, and exploded. Today all that remains of the original pad is a stairway from the Apollo era that ended in 1972. It was that stairway that Pete and other reporters began their climb on Wednesday up 350-feet to the top of the new Pad 39-B which will be under construction until 2017 at an estimated total cost of $350-million. It’s not clear what vehicles, if any, will actually launch from 39-B, and the date of 2017 is just that — a date. In the week before the Mars Science Laboratory launch, NASA took the opportunity of the large number of accredited media being on site to brief the press on a wide range of topics, beyond the MSL itself. 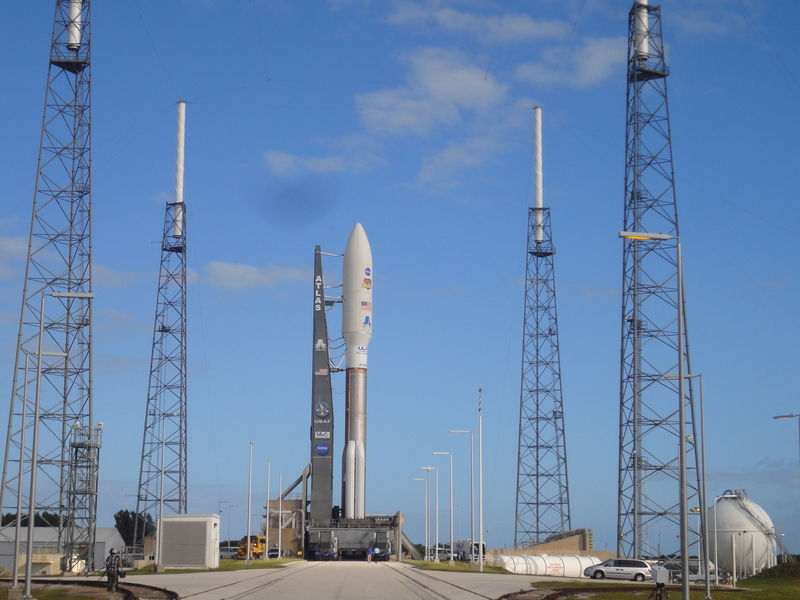 Subjects included the radiological lab where radiation is monitored when, as will be the case with the MSL, radioactive materials are on board a launched vehicle. The media was briefed in detail on how, currently, NASA plans to place humans on Mars and return them safely at the end of a 900 day mission (to be launched no sooner than 2030). The media visited the Vehicle Assembly Building and saw the Shuttle Endeavour, now parked there … and more.